TROY, Mich., June 1, 2017 – Altair announces the release of FluxMotor™, a dedicated platform focusing on the pre-design of electric rotating machines. FluxMotor is part of Altair’s HyperWorks® CAE Suite, which includes Flux™ the leading software for low frequency electromagnetic and thermal simulations. The software tool allows users to design and create machines from standard or customized parts, as well as to intuitively add windings and materials to run a selection of tests and compare machine capacity. 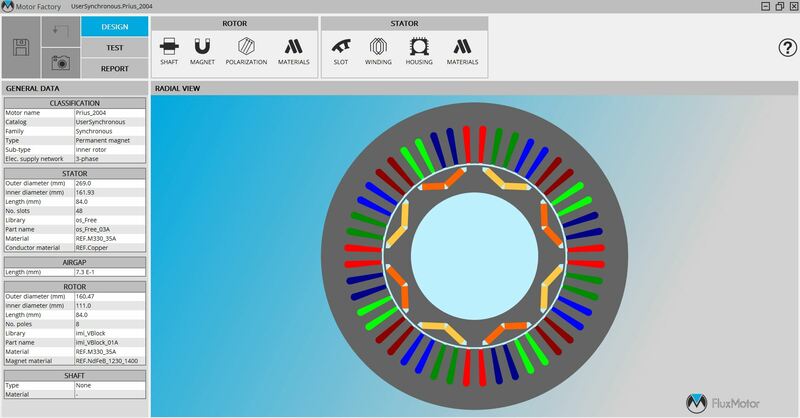 Appealing to a broad range of users such as designers and manufacturers of electrical rotating motors, the software allows motor specialists to define machines and assess their technical-economic potential within minutes. FluxMotor's efficient working environment ensures a better visualization of machine performances, enabling fast and accurate computations which can easily be connected to Flux finite element software and other tools within the HyperWorks suite for more advance studies, including multiphysics optimization capabilities. The motor catalogue environment allows easy management of motors and projects, helping the user to classify the machine and offers a quick access to past studies. If you would like to learn more about FluxMotor, please visit the website or register for our introductory webinar on Tuesday, June 13th at 10am EDT (4pm CEST): Register here for the FluxMotor webinar.